Club Penguin Cheats by Mimo777 Club Penguin Cheats by Mimo777: Club Penguin Christmas Party FREE item... The Tree Topper! Club Penguin Christmas Party FREE item... The Tree Topper! 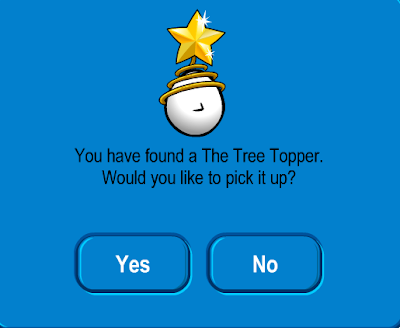 The December 20th new Club Penguin FREE item from the 12 Days of Free Gifts in the Forest is here! Saweet! This is so cool and WAY better than a new pin or background, right? Mimo-- If u go to the beacon you will see the goal. . . NOTHING! Mimo!! I found a glitch! Every penguin in sight of you says it has 5 star membership even if it doesnt but this does not include your own penguin. Ya way better!I was get bored of the pin and backgrounds! These gifts are disapointing and lame. Enough said. not really good i prefer a wig i REALLY want one! !